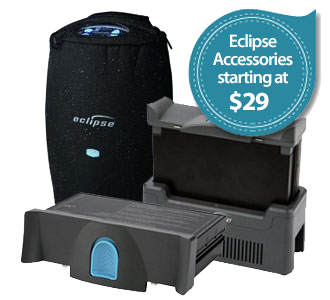 We carry a wide selection of Eclipse accessories. Please call us at 1-877-774-9271 if you have any questions. We have everything you need for your SeQual Eclipse 3 and SeQual 5 portable oxygen concentrators. Accessories include batteries, chargers, universal cart, wheelchair pack and more. These accessories help extend the life of your concentrator and make it easier to travel and do the things you love. We offer the lowest online prices on SeQual Eclipse 3 and Eclipse 5 accessories and always have inventory that ships same day. We offer a wide range of accessories you'll need to use for Eclipse 5 and Eclipse 3. Sometimes you'll need to replace a lost or damaged accessory, or your old one is now worn out and needs replaced. We know how important these accessories are to your oxygen therapy, so we make it as easy as possible to purchase new ones, and stock up. It's always a good idea to order extra batteries for your Eclipse portable machine. Not only will you find yourself needing them in the event of an emergency, but you'll need them if you plan on traveling and going on vacation. The Eclipse 5 power cartridge can be charged in the unit itself, or with the external battery charger. This is convenient, because you'll have multiple batteries all charged up and ready to go with you. These external rechargeable batteries are long lasting, and will charge up to 100% for up to 300 recharges. After that, they will only charge up to around 80%, and begin to decline from there. This is when you know to order new batteries. We can ship them out and have them to you within 24 hours. It's completely safe to charge and run your Eclipse at the same time with DC power, on all settings. In previous Eclipse models, you could only do so up to a certain setting, or risk draining the car's battery. This makes it much more convenient, because you can have your battery charged up before you reach your destination by car. Getting a different DC adapter for each vehicle you travel in on a regular basis is important. If you switch them too much, they risk wear and tear much quicker. You are also likely to forget the one you use when you get into a different car. Even though the Eclipse is on the bigger end of the portable oxygen concentrator scale, the mobile cart makes it extremely easy to carry around wherever you go. It's lightweight, small and easy to move around even the tightest spaces. When you sit down, just push the handle down and out of the way. The protective cover for your Eclipse is essential. It will keep your concentrator dry and prevent damage from the elements, as well as accidents, bumps and dings. You'll need to change the gross particle filter in your Eclipse once a year. These filters are inexpensive, and we sell them in packs of 6.